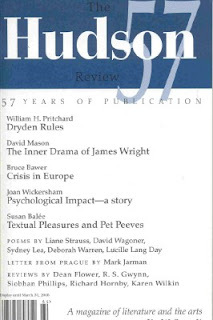 Some time ago, I picked up a copy of the Hudson Review (Vol. LVIII Number 4, Winter 2006)—very possibly this was one of the freebies from the IU Writers’ Conference last June. I sure hope, at least, that I didn’t pay for it. The cover (rooted firmly in the fifties, if not earlier—-time for an update) proclaims that it is “a magazine of literature and the arts” and that it is, but heavy on the arts (whereas I’m more interested in the literary content). While there are reviews of music, theater, film, dance, and exhibitions, the issue includes only a dozen or so poems and just one short story. But what a story! “Psychological Impact” by Joan Wickersham is a terrific story, surely one of 2006’s best. The story, told in 14 separately titled sections, is about a woman dealing with the house in which her husband (the narrator’s father) committed suicide. She can’t bring herself to throw away his things, she is afraid that it will be difficult to sell the house because of what happened, she has trouble managing her anger. Years later, the bag is still there. This is a nearly flawless story. the most unlikely tales ring true. The funeral proceeds and we hear rain on the roof, a door slam, a dog bark. They are “the sounds of life, which is a show, and must go on.” Good stuff. Also on the site at that time was a story by Jan Ellison, “The Color of Wheat in Winter.” Ellison’s story in The New England Review in 2005 was fantastic, as I noted here, and deservedly won an O. Henry Prize, so I was delighted to see her work again. Here, the various elements of Frances’s world are set for a collision: she feels pressure from her resentful mother; there is the new woman in her father’s life; the boy at school who pushes her ever further; the married man at work whom she thinks of. All of which makes the last clause (“the sound of something about to break”) resonate. Another fine story. >I found this journal to be a bit dry. >”Dry” is a good word for it, but at least I won’t feel guilty for not subscribing.